This is a chapter from Jamie McKenzie's book, How Teachers Learn Technology Best. It originally appeared as an article in eSchool News. © 1999, J. McKenzie, all rights reserved. More information about the book is available online here. Coaching may be the most effective way to convert reluctant colleagues into enthusiastic users of new technologies. As mentioned throughout this book, in the first twenty years of introducing computers to schools, we relied too heavily on staff development classes to introduce computers. These strategies, if we were lucky and talented, sometimes reached an enthusiastic 15-30 per cent of our colleagues. But now we need to reach the perennially reluctant and those who have been eager but frustrated. In order to extend our reach so that nearly all teachers are participating, the times require quite different strategies. Programs that emphasize coaching and mentoring relationships encourage the growth of technology enthusiasts while also supporting and enlisting teachers who have previously been thought reluctant, resistant and technology challenged. The secret behind this method is the customization made possible when a coach or mentor works alongside one or more colleagues. The learning opportunities are matched to the readiness level, skills and preferences of each teacher. The content is drawn from the actual curriculum. The experience is fully integrated into classroom life and expressly designed to produce student learning. Technologies are infused in ways that support teacher goals. There is nothing diversionary or disruptive about the time investment. To launch a coaching program, a district sets aside funding for full time staff positions that are meant to last anywhere from 3-5 years. 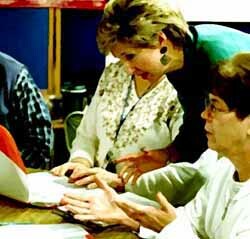 Each coach can team with 20-35 teachers per year in projects that last anywhere from one to two weeks. The goal is to reach every teacher within a 3-5 year time period in a succession of waves. Each project begins with planning sessions during which the coach and the partner identify a chunk of curriculum that might be well served by the introduction of electronic technologies. The coach and the teacher then develop and implement a unit plan to implement and test as a team. The best coaches put their partners at ease. While it is tempting to hire impressively advanced technology pioneers as coaches, the most important criteria have to do with the diplomacy, tact and relationship building necessary to win the confidence and trust of partners. We need to be cautious about promoting teachers whose superior performance and attitudes might actually hamper their effectiveness with peers. Coaching must engage both the coach and the partner in planning for technology use. It is not uncommon for classroom teachers to view the coach as someone to teach technology to the students. Instead of participating as full partners in the design and delivery of technology rich lessons, they might prefer to sit at the back of the room correcting papers while the coach offers a welcome respite from the normal teaching routine. It must be clear from the very beginning that the classroom teacher remains the teacher. Coaches do best when their role is clearly defined on a single page that can be handed to partners and others such as the building principal. If coaching is new to a district, there will be many misunderstandings regarding the purpose of the program. A clear job description can help by mapping out just what the coach does. And just what the partner does. Some leaders also create a list of tasks coaches are not expected or allowed to do. This job description becomes an important tool to assist with the development of a new working relationship. Coaches are not substitutes. They are partners. Both the coach and the partner must feel shared responsibility for the technology infused lessons. Both participate in the development and the testing of lessons. Both invent. Both teach. Coaches must be cautious about attitude. Many teachers who do not make much use of electronic tools are extraordinarily effective and talented professionals. If coaches view their role as correcting deficiencies, the chances of creating trusting partnerships are remote. Joint time to invent technology rich units increases shared ownership of innovations. For each week long unit to be developed and implemented, the coach and the partner will need as much as a day away from pressing classroom demands to work on the lesson planning. Without the provision of joint planning time, it is tempting for the coach to step in with lessons created without the partner's engagement. Growth is most likely to be widespread when everyone is expected to participate without exception. The district clarifies technology expectations for each level in curriculum guides and all teachers are given 2-3 years to develop the ability to translate those expectations into classroom realities. Commitment to this learning process is formalized in annual professional growth plans that are shared between principals and teachers. The question is not whether a teacher will participate. It is "when" and "how" that becomes the issue. The coach contributes encouragement as well as knowledge to help the partner find new ways to achieve success in the classroom. The partner contributes curriculum savvy and experience to guide the invention process. This is a case of mutual support as two professionals consider the best ways to blend new technologies into classroom life. The best results emerge when the experience is well matched to the partner's style and characteristics. This is not about showing teachers to teach the way the coach would teach. The coach empowers the partner to make use of technologies in ways that dovetail with the partner's teaching style. At the same time, we would hope that these technologies might allow many teachers to broaden their repertoire and expand their range of styles. Those who have relied mostly on direct instruction may come to value the student learning that can result when students are required to do more of the work. The ultimate goal is to pass the responsibility for continued success to the partner. This coaching experience should be viewed as an interim measure to support program development, with the coach eventually disengaging and moving on to work with others. The partner carries on and extends the newly acquired strategies to other units and other lessons. If the coach returns in a few months or the following year, it is not to "repeat the technology unit." The next round of visits prompts the development of a new unit. More growth occurs when there is a system to track and recognize change. In many places, failure to collect evidence of change can contribute to uneven implementation and can result in "virtual change." The reporting system may be as simple as a monthly note to the principal indicating when and how teachers are carrying out the technology expectations written into the curriculum guides. Despite the strong case that can be made for peer coaching, coaches and mentors frequently report surprising levels of resistance. It takes considerable talent, persistence and tact to steer over, around and through the many obstacles that may arise whenever one teacher in a system is offered as a resource to support the growth in teaching of another. While these obstacles rarely surface in a public manner, they can swiftly negate the influence of a coaching program that ignores them. Some people love the privacy that accompanies the job of teaching. You enter your classroom, shut the door and rarely see another adult enter. While some teachers welcome visits, partners and team opportunities, others prize their separation and their privacy. They do not welcome other teachers within their domain. In many schools there is a pecking order that may have nothing to do with teaching skill. When one teacher is designated as especially talented in some respect, it may turn power relationships upside down, setting conflicts in motion that may undermine the value of the coaching. If the coach is younger and highly talented, he or she may be taught a few lessons about power. The intended recipient of support may resent the implication that help is needed and may punish the coach for violating the established order. Some folks have invested decades in the creation of master teacher images that they are usually reluctant to set aside for any reason. While many of us see continued learning and reflective practice as a sign of a masterful teacher, some equate this process with disrobing and dismemberment. They may resist coaching because it represents an "unmasking" that threatens ego. Learning almost always involves discomfort, and yet there are those working in schools who seek to minimize discomfort by keeping life moving along as smoothly as possible. Because a good coach will nearly always ask partners to venture out of their comfort zones into new territory, their offers of support may be seen as threatening rather than reassuring. The best coaching programs will provide district coaches with many opportunities to step back as a team to consider the change process. Which strategies are working? How does the program need to be changed? Which strategies should be discarded? What are the best ways to involve principals? What new discoveries need to be blended into the original model? Frequent gatherings of coaches are essential because they are one of the best ways to overcome the obstacles mentioned in the second part of this chapter.